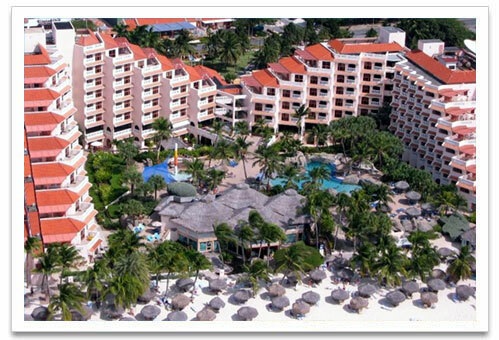 Playa Linda Beach Resort is located on beautiful Palm Beach overlooking miles of Caribbean coastline. It is comprised of 212 units. This resort offers studios, one bedroom lanai suites, two bedroom luxury suites, and townhouses. There is a magnificent freeform tropical swimming pool complete with a cascading waterfall. It has a children’s pool, four Jacuzzis, two outdoor bars, three lighted tennis courts and a playground area. There is a shopping arcade, mini market, game room, fitness center, hairdresser, laundromat, and car rental desk. This resort features Spa Del Sol, where you can enjoy a relaxing rejuvenating massage. There are four lovely restaurants on the premises for the guests’ convenience. This resort is undergoing renovations which should be complete by the end of 2010. The Palapa Activities Center features activities from Monday through Saturday, including pool aerobics, bingo and more. Playa Linda Beach Resort has an extensive program for children. For your e-mail and computer needs, the Cyber Station in the lobby is open 24 hours. Studio units offer a mini kitchen, full size fridge, microwave, coffee pot and toaster, Queen-size bed plus pullout sofa, plus four seat dining table, cable TV, safe deposit box, iron and ironing board and a private balcony. Accommodates up to 4 persons. Two Bedroom Suites offer spacious master bedroom with a king-size bed, dresser with cable TV, lounge chairs and its own private balcony, and bathroom. Second bedroom features two twin beds and a dresser. Fully equipped kitchen, living and dining room with six seat dining table, pull out sofa and chairs, cable TV and a large terrace with a breath taking view.